Turn up the volume in tight bedrooms, entries, or kitchens with stylish space-saving ideas that make the most of what you have. A big bed can work in a petite room as long as it's treated like a showpiece with splashy linens and whimsically mismatched side tables. "It's making maximum use of cramped quarters—just leave enough room on either side so you can walk around," says New York designer John Loecke. —Loecke painted the trim in a contrasting coat of high-gloss paint. "Without a window treatment you can see the view outside, and the room feels more open," he says. —"You might be tempted to furnish minimally," Loecke says. "But filling limited square footage with pictures, patterns, and colors actually makes a space look more welcoming and expansive." A tall piece of furniture can draw the eye up and away from a kitchen's modest footprint. 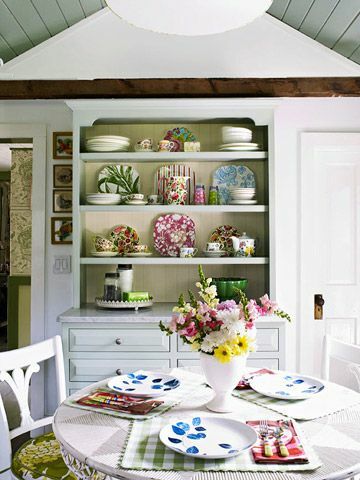 This cupboard functions as a sideboard as well as a place for storage—a boon for those with limited cabinet space. —Loecke stocked the shelves with a hodgepodge of china, including flea market pieces. "You wouldn't be drawn to the hutch or find it as interesting if the china were all white," he says. —A round table fits more easily in a tight space than a square or rectangular one and seats more people. Dark espresso walls and pattern mixing give this guest room a cozy feeling. "You might get tired of a bold print in the living area but it can make a tiny, less-used space exciting," says Loecke. 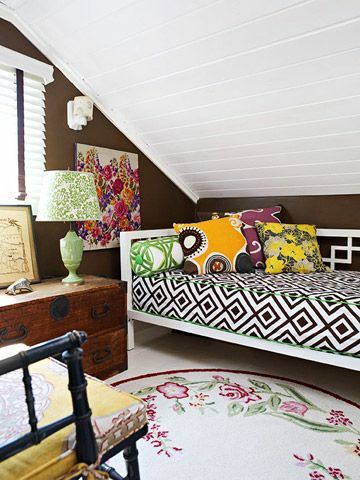 —A painted white floor and ceiling further open up the space and are more modern than stained wood or carpeting. —Loecke deliberately chose a variety of furnishings, like the antique Chinese chest and the contemporary clean-lined daybed from westelm.com. "When you mix different styles, you get a comfortable, timeless look," he says. —Pack a small room with lots of options and you'll live larger. This daybed serves as a retreat to curl up with a laptop or a book. The trunk stores linens and does double duty as a side table. 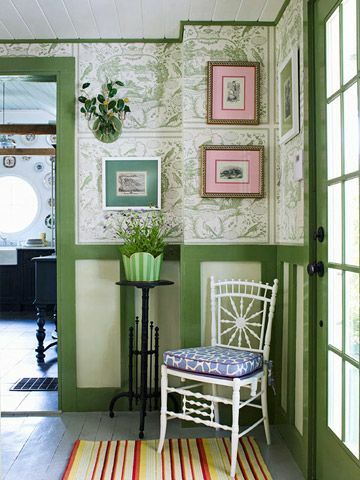 A little something in the entry, like a narrow perch for flowers, creates a welcoming focal point for guests. —A composition of pictures, placed unpredictably and irregularly atop decorative wallpaper, accentuates the intimacy. —A chair can fit in a space too tight for a big table and provides a place to remove your boots or toss the keys or mail. Add a cushion for an extra dash of color. —Loecke replaced a solid door with multipaned glass that lets light in to make a bigger impact. Originally published in the April 1, 2011, issue of Family Circle magazine.